It appears to be a fashionable development at the moment to look towards an open area such as a park or other kind of public space and see a positive improvement in many areas by way of the amount of outdoor equipment available. This includes picnic benches and park benches with which people can make use of the surrounding areas so much more so than ever before. As we attempt to get our children ever increasingly more into the outdoors and take time and consideration to enjoy the open areas around us, it is fantastic to see the variety of park benches that are an option to take advantage of, whether that is to sit and enjoy a picnic in the sun, or perhaps to simply sit and enjoy a relaxing cup of coffee whilst the children make use of the facilities around them. What is evident is the rise in memorial benches, which appear to have grown to become more popular than ever in parks and public spaces through which loved ones and family members can donate a bench with an engraved message to perhaps be sited in a favoured location in which people spent time with each other. They are a lovely reminder of special places and warming to many people who sit and spend time on these benches. Needless to say it's not only public places which happen to have outdoor areas that may take pleasure in picnic benches being accessible. 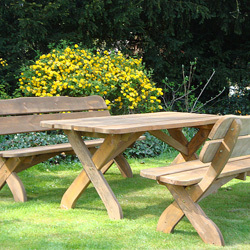 Organisations are getting to be more acquainted with the wishes of their own personnel wanting a little thinking time during the working day and where possible park style benches fit in very well into the company image for workers to spend their break or lunch times unwinding and recharging their batteries ready for the remainder of the day or even for a relaxing drink after the work is done. Social events laid on by companies can be the perfect opportunity for an organisation to make use of outdoor areas, together with picnic benches they may have, entertaining staff and clients alike. For organisations in search of that extra something special engraving their company name or message into a bench can be found in a number of areas for promotion or additional exposure and is a great idea to get the message across. For more commercial establishments such as pubs and clubs, picnic benches are ideal for the garden areas, and as long as the weather is not too cold or wet, you can almost guarantee customers will be sat outside making use of them in all seasons. 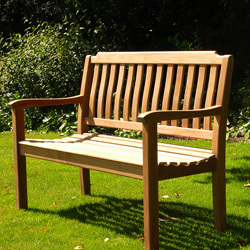 The range of styles of park benches as well as picnic benches becomes ever increasing with traditional, classic wood materials such as teak and also hardwood from responsibly managed forest areas joined by more modern contemporary alternatives, for example recycled plastics provides you with the chance to do your bit for the environment. It appears not only private outdoor areas and gardens are a great place to spend time relaxing on a bench. The range of picnic benches available for the commercial sector makes it a great time to be out and about enjoying the best of the parks and outdoor areas available as well.